Aeon principal conservators, Alfonso and Lane, recently completed the conservation treatment of the 1903 statue of General Sherman, which stands near the White House in downtown Washington. 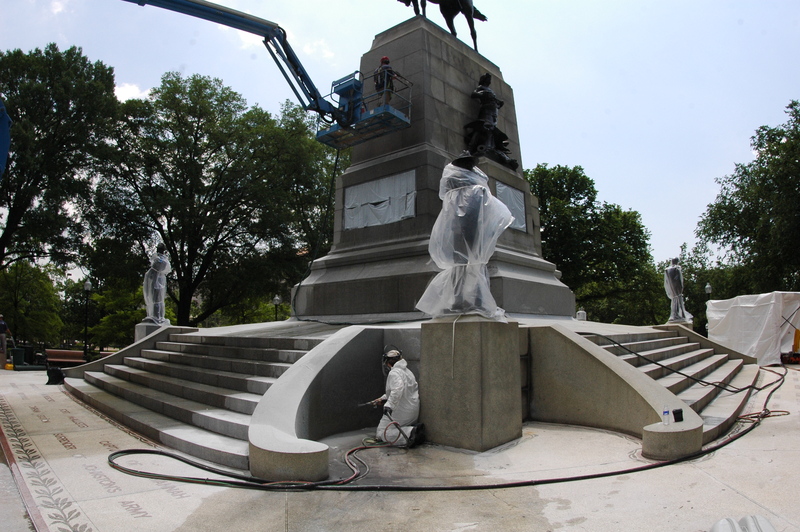 The bronze, stone and terrazzo monument has been undergoing an overall landscape and sculpture restoration project for the National Park Service by the Christman Company. Aeon was hired to complete the conservation cleaning and repairs to the stone surfaces – after the bronze statue and numerous medallions and reliefs had been cleaned and waxed. This laid down the challenge for Alfonso and Lane to carry out their work on the 28ft monument while carefully protecting the bronze so that the previous work remained pristine. The project was also made more demanding by the tough access and time restrictions that were required as part of working in a high security area. Lane and Alfonso examined the granite pedestal and steps of the statue to assess it for repair and to recommend cleaning treatments. They found that the stone had become discolored likely due to an earlier coating, and that some areas had been damaged by chips and poor early repairs. Aeon’s tests showed that micro-abrasive cleaning could gently and successfully remove the staining and other accretions which had built up on the surface. But although using micro-abrasives would be safe for the environment and for workers and passers-by, it could easily damage the bronze restoration work. So Lane and Alfonso devised a system to safeguard the bronzes by enveloping them in shrink wrap plastic, a material more usually applied to boats in storage. Metal shields in a variety of sizes were also used to deflect the cleaning media. Lane uses the Rotec to clean the masonry. Managing a team of four conservators and masons, Aeon went on to use the Rotec Vortex system with superfine crushed recycled glass and water to clean the discolored stone work without damage to the fine-tooled surface. Then, with the original color of the stone revealed, older patches could be removed and replaced and the chips filled. Despite the constraints of limited access, poor weather and the location, Aeon completed the work within 6 weeks.